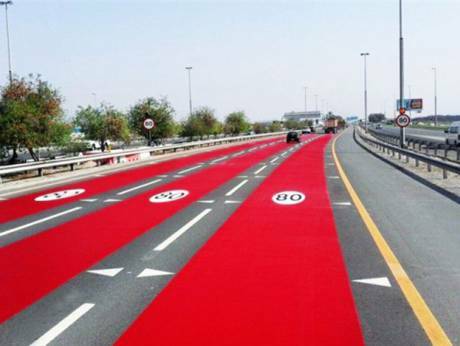 According to the Roads and Transport Authority (RTA) in Dubai, the experiment involved colouring all lanes in an eye-catching style to alert road users of the new speed limit. This is the first initiative of its kind carried out in Dubai, and the RTA has confirmed that the asphalt colouring will also be used in other areas of the city, such as Shaikh Zayed Road and the Jebel Ali-Lehbab Road. Currently, you can spot the red road on Oud Metha Street near the Bu Kadrah Interchange, along the extension of Dubai-Al Ain Street. The maximum speed limit was reduced recently from 100 to 80 kilometres per hour. She said that the next red-coloured road will be on Sheikh Zayed Road near the fifth interchange, with the speed limit changing from 120 km/ph to 100 km/ph. It will also be applied to the Jebel Ali-Lehbab Road near Lehbab, with the speed limit also set to reduce from 120 km/ph to 100 km/ph, “so that motorists can avoid speeding and radar tickets,” said Bin Adai. “We anticipate that this course of action will contribute to lowering the number of future accidents. Similar previous actions have contributed to reducing the number of traffic deaths on key streets and highways, which are witnessing the largest number of traffic accidents in the emirate,” said Bin Adai. New traffic rules: How are UAE roads going to change?